We are very lucky to have many folk in South West Scotland who enjoy being out in the natural world and volunteering their time to help conserve our native wildlife. Some have had careers in wildlife conservation, others are photographers or artists, whilst many are just keen to try and help find out the population levels and distribution of some of the species in our locality. Global warming is affecting many species in ways we don't fully understand yet so we need many more people send in their sightings of any and all creatures they find, from hoverflies to hedgehogs, bats to badgers...to help build the bigger picture and conserve both species and habitats that are under threat. Dumfries and Galloway is an important region to monitor, since it is seeing certain species appear in records that have hitherto only been recorded further south. This may be because of climate change or it might be due to other factors. To try and put a bigger picture together, we need data - lots of it. Wildlife records are important in helping researchers understand larger trends in population increases, declines and movements. This data then helps species conservation organisations plan their strategies with greatest efficiency. This tends to vary from year to year and according to the locations and interests of the individuals involved. 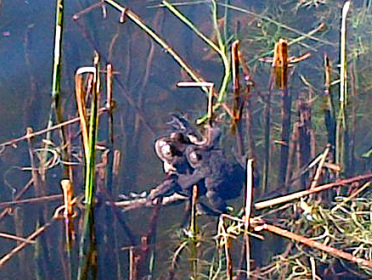 For instance, every spring and summer there are folk monitoring amphibians and reptiles on local ponds all over the UK. In addition to frogs, toads and plenty of spawn, they've seen Great Crested Newts, Smooth Newts and Palmate Newts and are hoping to record Grass Snakes, Lizards, Slow Worms and Adders to add to the records.